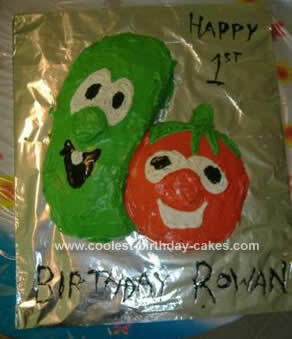 This Veggietales Birthday Cake is the first character cake I’ve made, and to be honest it wasn’t all that hard. I made two cakes. The first in a round cake pan, I used vanilla. The second in a rectangular cake pan, I used chocolate and swirled the left over vanilla mix in it to make a marbled affect (I did not need a second round cake). After the cake had fully cooled I cut Larry’s (cucumber) shape out, being careful to save the left over for the noses and the stem on Bob (tomato), and made sure that it fit snugly to the round cake. I used Vanilla icing for both cakes, tinting it red, green and black with gel icing dye.